Getting the money together to build a house can be an enormous challenge. The possibilities include saving up enough money over time, paying for it with earnings while doing the construction, or borrowing from friends, family or a bank, and then paying back the debt over time. All of these options have their pros and cons. Saving money is a good way, but it means postponing the pleasure of living in your dream home, and it can take a long time to save enough money. Paying as you build with income can be a lengthy project because not only are you limited by available resources, but you must work while trying to oversee the building. Borrowing money is likely the fastest way to be able to move in, but then you are committed to a lengthy (and costly) payback period. 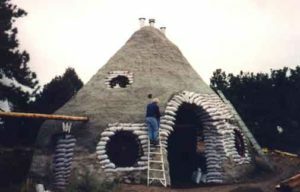 When we started to build our unusual earthbag/papercrete house in 1997, we planned to do so without incurring debt, hoping to pay for materials as we needed them. We were comfortable living in our bus conversion motorhome, so aside from the Property Owners Association deadlines, we were in no hurry to finish the building project. For the first year we managed to buy the materials we needed and our plan was intact. Then in 1999 we learned about Y2K. There was considerable uncertainty about what the future would bring, and we realized that we might be much better off if we had the house completed. Not having much in savings, we faced the challenge of how to pay for everything necessary to make the incomplete structure a home, along with other supplies to give us some sense of security about the future. It took some real soul searching to come to the conclusion that our best course was to take on some debt to accomplish our goals. So out came the credit cards; it’s so easy to turn plastic into wood, glass, pipes, electrical fixtures, etc. And of course the other end of the deal are all those little envelopes that emerge from the P.O. box wanting their pounds of flesh. To be honest, we managed the credit card debt pretty well. I became quite adept at playing a shell game of accepting the continual offers of 2.9% to 4.9% interest for a short period of time, then switching the balance to another card when the time expired. I made a spreadsheet on the computer to keep track of it all. We never missed a payment and kept our good credit record. Over time this method of handling debt became rather tedious, and as the amount increased, it became harder to keep the interest at a reasonable level. Once we finished the house our plan was to sell the bus motorhome and pay off all the credit cards. As it turned out, the bus was not all that liquid. This situation brought before us the question, “Is it time to consolidate the debt and seek a mortgage on the house?” Interest rates were dropping and the time seemed ripe to do this. OK, even knowing that the word “mortgage” comes from a French word meaning “death pledge,” we decided to go for it. We shopped online for the best possible deals and input our application at e-loan.com. We were even able to access our “credit score” for free at this site. The application was fairly straightforward, and we were hopeful that it would be smooth sailing. Our credit score was plenty high and our income was adequate for the amount we wanted to borrow, so it came down to the appraisal on our house. This seemed to take forever! They generally work with a national organization for their appraisals, and they tried two different local agents. Several weeks later there was still no appraisal. I finally did some research to find out who does local appraisals and got an excellent recommendation for one in particular. I emailed e-loan this information, and within two days that appraiser paid us a visit. The appraiser had worked in the banking industry for many years before starting her own appraisal business. One of the first things she said when she looked at the house was, “They never loan on domes.” She then proceeded to provide us and e-loan with an excellent appraisal of our house, complete with photos taken both inside and out. She loved the house, and knew the value of a custom home. She cited many comparable house sales in our area, but none of them were domes because there were no sales of domes. 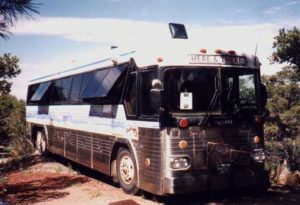 About this time we got an inquiry about the bus for sale. While discussing this with the caller, he indicated that he was a mortgage broker. I told him that we were trying to get a mortgage on our house, and I described it to him. He said he was fairly sure he could help us, and that he would see what he could do. The world works in strange ways. In a few days he called back and said he thought he had found an underwriter who would take our house, but he wanted to see the appraisal. Again we waited for the shoe to drop. This time the response was, “Yes, I will loan on this house, but I want to see some comparable sales of domes in the area.” Try as we might, there wasn’t a single such comparable sale. So that was the end of that. Friends recommended our local credit union, where we have our business checking account. We knew they had made many loans on houses here, but there were two drawbacks: their interest rates were a bit higher than the others, and at this time they can only make a five-year commitment, so the loan would have to be renegotiated at that time. They were very encouraging when we brought in our application, and soon our loan was accepted. Thank God for some enlightened souls who can see beyond formulas based on conventionality! Also, now our interest payments will remain in this valley, which feels much better than off to Bank of America. I guess the moral to this story is don’t expect the big boy bankers to embrace unusual construction. 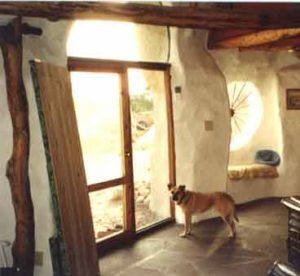 I know that quite a few strawbale houses (that look otherwise fairly normal) have been financed conventionally, but the industry really needs to be educated about the value of natural, sustainable architecture. We once were told by an insurance agent that they don’t insure passive solar homes that have no central heating! We could leave our house in the dead of winter with no heat other than the sun, and it would never freeze inside. There are a few enlightened lenders out there, but you really have to search them out. I’m still convinced that the best way to finance the building of a house is without going into debt. The interest paid over a thirty year mortgage is often double the principal that was initially borrowed. So, if you want to build an alternative home, you may need to find some alternative ways to finance it. The best assets are determination and perseverance; with these you will eventually find yourself in your dream home. Your house looks amazing. 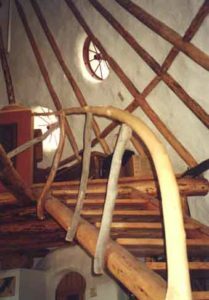 If I had others to help me build, I would love a geodesic dome or a wooden yurt or (ideally) an earthbag fort! But it’s just me, and it doesn’t look like that’s going to happen any time soon. I hope the site stays open and active! It’s one of the few blogs I read. I do plan to continue this blog. I may not post things as often as Owen did, but rest assured that it will proceed. their patented ziptie shelter dome kits make it possible to build their kit as your framework. then cover/spray,etc with the materials to create your dome home. at the very least this could help to inspire you to build dome for a building to use as temporary quarters while building something else. i am dreaming to use one of their SILO shelter dome kits as my framework. it has a base which is straighter vertical which offers more ground floor head space. then can add a loft/upper floor or such with a 13′ or larger diameter model. John Hurt is a kind soul to collaborate with and to answer any questions you have. also take a look at straw bale arches online images. these are gothic arch covered with bales. for outer protection, you can spray, plaster or cover with cladding such as metal roofing. many blessings on your adventures. keep us posted, as there are many of us with your dreams. 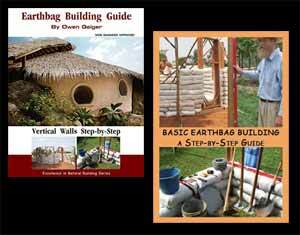 Hi Laura, here is a blog post from this site in 2011, where Owen shows how to protect an earth bag vault from the elements. While I agree a 30 year mortgage is a horrible thought, it’s a fairly simple task to pay it off a lot quicker by adding additional funds to the monthly payment. One or two less coffee’s and days eating out etc make it very possible to pay of the debt a lot sooner. Like all investing / consolidation of debt, it’s about having the self discipline and long-term goal firmly in your mind. thank you so much for sharing your ideas and how you were able to accomplish your loan and home!